One of my virtual clients (she’s a real person, but we worked together via the internet!) 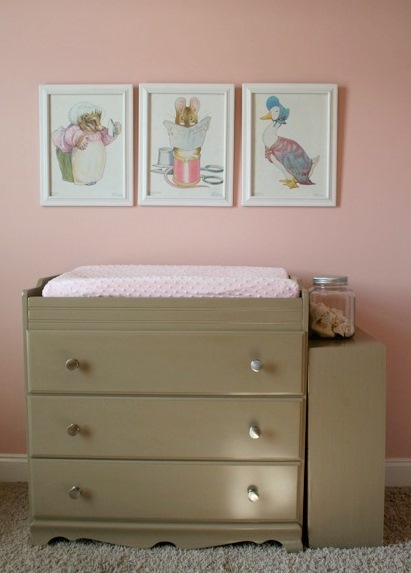 just sent me some photographs from the finished nursery I designed for her a while back. You may remember this post I wrote about the 2 bedrooms I designed for her long-distance through the magic of computers. 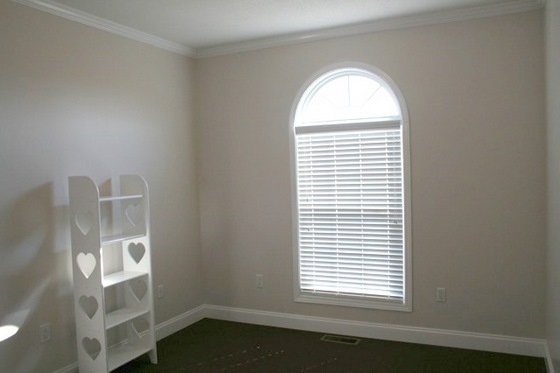 The before of her daughter’s nursery was a blank slate. And I do mean BLANK. However, she did have several pieces of existing furniture and accessories that needed to be used, including some Beatrix Potter artwork and this very dated glider. The baby was currently set up in her parent’s bedroom (the new nursery was previously an older son’s room) in this bay window area. 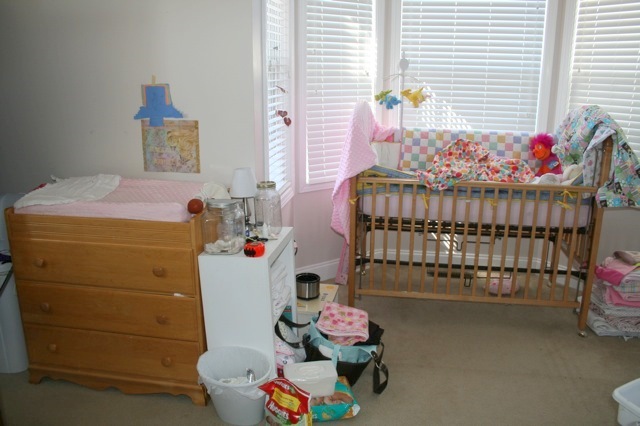 My client needed to keep the crib and orangy wood changing table/dresser, so I’d have to work with those. Sometimes the biggest challenge is working with existing elements in a way that still gives you the look of a fresh, new room. We decided upon Benjamin Moore’s Rose Blush 037 for the walls, and Alexandria Beige HC-77 for the ceiling (as a Nashville color expert, I’ve found that Benjamin Moore colors are the BEST). 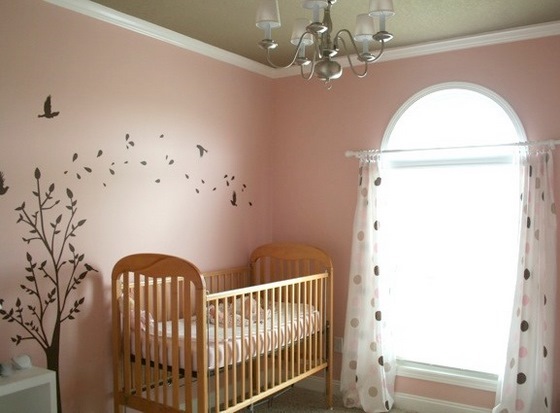 This is a color scheme that will last well into the baby’s elementary years (even beyond). I chose a medium-pile frieze for the carpet so that the floor will be comfy and warm when the baby begins crawling about. My client was on a budget (and who isn’t? ), so I chose a simple light fixture available at her local Lowe’s that could be spruced up with some cute chandelier shades. 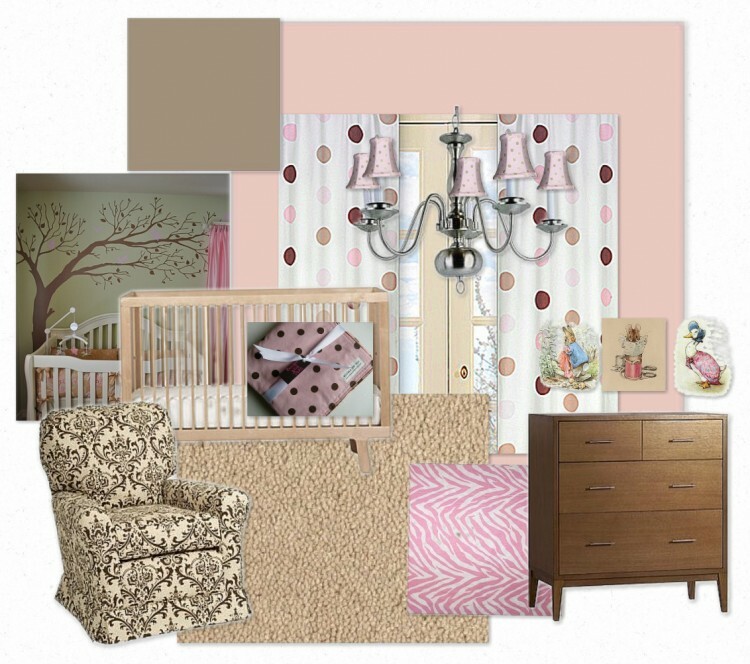 To give the feel of a new dresser/changing table that works with the new scheme, I suggested she paint the current one the same milk chocolate color as the ceiling. 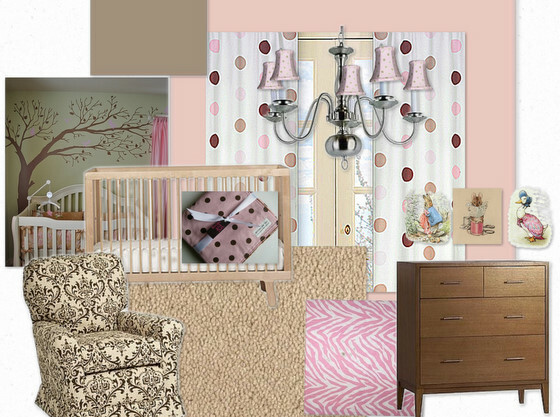 You’ll see I tried to incorporate a few different patterns in regards to fabrics, so it would feature polka-dots, but wouldn’t feel like a polka-dot themed room. 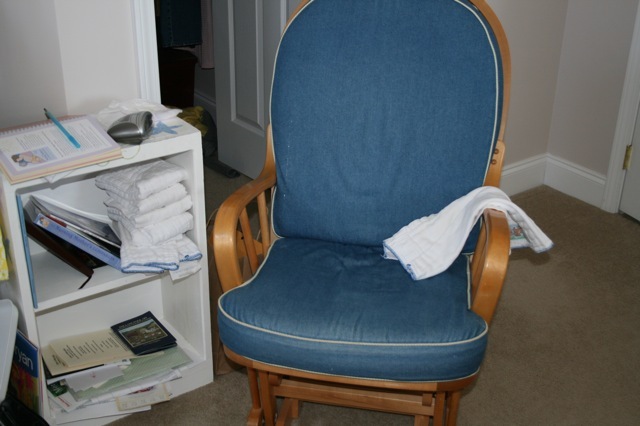 The chair here is representative of an inspiration fabric to use in recovering the cushions of the existing glider. Ready to check out some real afters? Isn’t it adorable? The glider looks brand-spanking new with these awesome new cushions! I knew she needed to keep her glider, but I suggested my client recover the cushions with a fabric similar to the one seen on the chair or the pink zebra fabric from the Inspiration Board. What a beautiful place to rock a little girl to sleep. If you like what I did here, I’d appreciate it so much if you’d share this on FaceBook. If you need some long-distance help decorating a room in your home, contact The Decorologist to schedule your Virtual Design today! 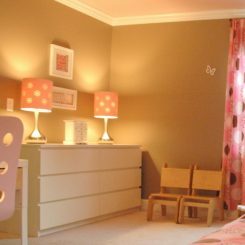 This entry was posted in Design Intervention and tagged alexandria beige, benjamin moore, benjamin moore rose blush, girl nursery, lowes lighting, nashville color expert, nursery design, nursery ideas, on-line design, the decorologist. virtual design, updating a glider, virtual decorating, virtual room design. To Decorate or To Undecorate? You continue to amaze me!! You are so good at what you do!! Thanks for your continued inspiration and encouragement. the color of the wall and ceiling is just fantastic. They are so dreaming feel. I love it. I wonder where she did the re-upholstering for the chair. she lives out in the country, and she said she got some old guy to do it for $50! and the fabric was on sale, so she totally scored! wow, that’s nit something you can come across everyday. Lucky her! I don’t have a facebook account but will willingly share with anyone who needs some decorating done. It is amazing to have done this via the internet..the world’s your oyster! !